Martin Frith is a Professor at the University of Tokyo. There, he has developed numerous beautiful methods to address pressing questions in computational genomics, resulting in software used by thousands. Brody Huval visited our Department today to give a guest lecture in Assistant Professor Douglas Brinkerhoff’s Machine Learning course. The presentation was incredibly engaging, providing an insider’s view of the technologies behind autonomous vehicles as well as winning strategies for startups. Brody facilitated many conversations with students, ranging from the ethics of AI, to the hazards of predicting pedestrian behavior. Huval is a co-founder and board member of drive.ai which spun out of Stanford’s AI lab. He has years of experience with AI and working with data infrastructure to support deep learning. He spent four years as a PhD student in Andrew Ng’s lab at Stanford researching deep learning within NLP and computer vision before dropping out to co-found drive.ai. At drive.ai he has worked on perception, mapping & localization, and the infrastructure to support deep learning. Montana offers a great environment for technology entrepreneurship, with over 350 high-tech companies and growing. The department of computer science cares about helping students engage with the entrepreneurial experiences Montana’s startup culture provides. Recently, UM CS faculty member Dr. Rob Smith was awarded a $224,000 Small Business Innovation Research (SBIR) grant from the National Science Foundation. This award will fund the employment of two department alumni at Dr. Smith’s company Prime Labs, and opens the potential for a second phase grant that would provide for several more jobs over the next two years. Prime Labs is building software for mass spectrometry that helps scientists analyze more data in less time than standard approaches. The SBIR is a highly competitive program (<10% fund rate) for early stage R&D in high-risk, high-impact technologies with the goals of fostering innovation and creating businesses and jobs in the United States. Previously, he was awarded an NSF Innovation Corps grant, which funded instruction on a national course for lean startup methodologies. Dr. Smith is enjoying the opportunity he has to train the next generation of student entrepreneurs through the Software Engineering course he teaches. On September 14th, the UM CS hiking club made its second outing, up the newly constructed Barmeyer trail. 8 students were joined by faculty members Doug Brinkerhoff, Trish Duce, and Alden Wright. Conditions were near perfect, 73 degrees and clear skies. 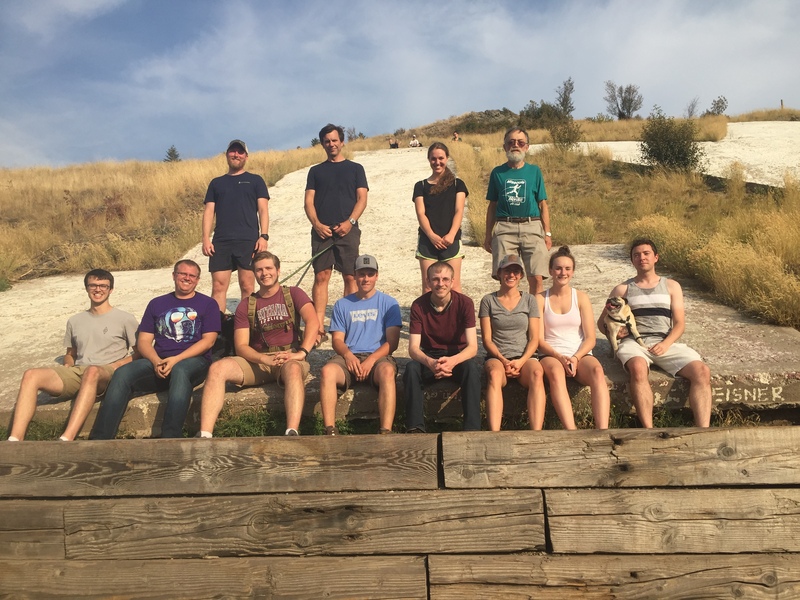 The UM CS hiking club (The Gradient Group) took its first walk on Friday, September 7. Students were led up the M trail by instructor Trish Duce. Conditions were good — 77 degrees F, sunny and some haze from smoke. 10 students were joined by Emeritus Professor Alden Wright and Department Chair Jesse Johnson. The Gradient Group will meet again on September 14, 2018 for a hike up the new Barmeyer trail. Meet at the trail head at 5:00. All are welcome!